I can't pass up Easter candy. It's packaged so cute and hard to resist. My favorite this year is the Twix Egg. (Oh. My. Wow.) I'm not sure if it's new this year or not, but this is the first year I've seen it and I literally have to force myself not to buy a whole palette full. Yes, they are that good. When Target had M&Ms on sale, I had to buy a bag. 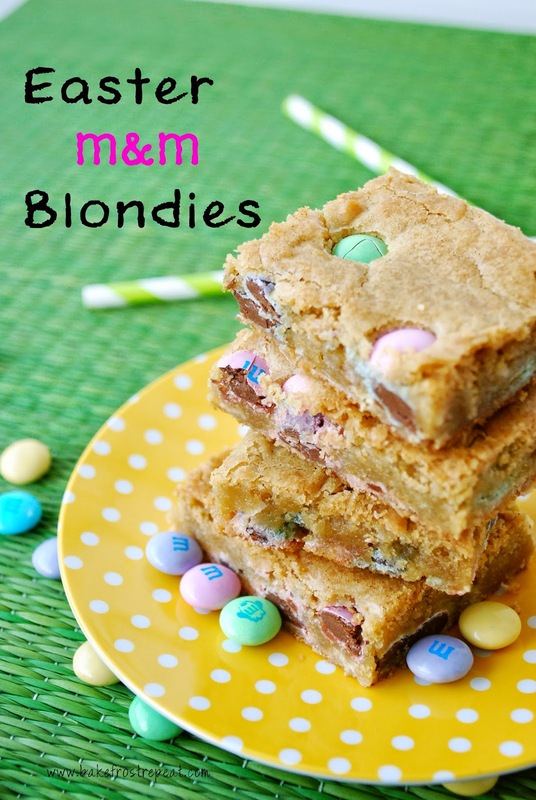 I figured I'd just make some festive M&M chocolate chip cookies for Easter, but as I was flipping through my cookbooks, I saw this recipe for blondies. 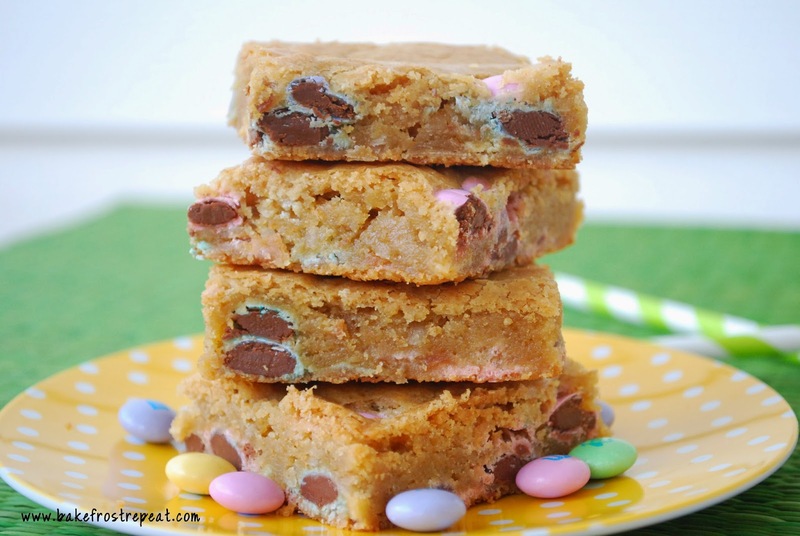 The original recipe is really for drunken blondies (which sounds totally amazing and I will definitely try at a later date), but I thought it would be great to throw the festive M&Ms in the mix and make them Easter themed. These blondies are really good. I love the soft, chewy, almost underdone texture and the M&Ms look so pretty. They are also easy to throw together, which is always a plus! Preheat the oven to 350 degrees. Grease a 9X13 pan and line with parchment paper, allowing the ends of the parchment to hang over the two opposite edges of the pan. In a medium mixing bowl, combine the flour, baking powder, and salt. Whisk together and set aside. In a large mixing bowl, stir the melted butter and brown sugar together with a wooden spoon until smooth. Add the eggs and vanilla extract and mix until thoroughly combined. Stir in the flour mixture, coconut, and M&Ms. (I left a big handful of M&Ms out so I could place them on the top of the mixture when it was spread out in the pan). Place the batter in the prepared pan and smooth the top with a spatula. Bake for 20-25 minutes until the top is golden brown. Remove the pan from the oven and let cool completely on a wire rack. Using the excess parchment paper as handles, remove the blondies from the pan and then cut the blondies into bars. Blondies will keep in an airtight container for up to 3 days at room temperature. Love the pastel M&M's in this! They look so chewy and yummy! I *almost* bought a Twix Egg the other day! Now I'm going to have to go back and get it! These blondies sound amazing. I love that they have coconut in them! Twix eggs?? No way! I wouldn't be able to resist those either ...Seasonal candy automatically tastes better than the normal, I'm convinced. These blondies look delicious! Yum. Yumyumyum. It's been forever since I had a blondie. These look fantastic! I am going to try to make these for work. Got my Easter M&Ms this morning. Thanks Shannon!! Shannon, I have a weakness when it comes to Easter candy... I can't resist them either! Loving what you created with the little candies!